One canoe, including life jacket, card, pick up of canoes at the end, costs DKK. 495, – per canoe. The price is including. user payment to the municipality. A canoe trip is a wonderful natural experience for most people. If you are young or old, to be close to nature is a recreation that provides peace and tranquility, that most modern people only rarely experience. On Gudenåen between Tørring and Mossø, it is only allowed to canoe from June 16th till 28th February the following year. Daily, it is allowed to canoe from kl. 8.00 am and until. 6:00 pm. It is only permitted to sail with the stream, i.e. from Tørring towards Mossø. The canoe can hold 3 adults or 2 adults and 2 smaller children. On the stretch, nature is very beautiful, whether sailing in the early summer, where everything is still fresh and light green – or you wait for September / October, where the colors are changed to red and golden. Day trips from Gudenåcamping Brædstrup to Voervadsbro (15 km) can be booked here. If you want another starting point or ending place, call for info. Tours of several days duration are booked by personal contact on telephone, per person or email. Emails are answered as soon as possible, and within 24 hours. A canoe trip on Gudenåen for one or several days can start in Tørring, Åle, Åstedbro or at Gudenåcamping Brædstrup. The manager ensures that the canoe is at the starting point when arriving. If you stay overnight at the campsite, free parking is offered at Gudenåcamping parking lot, until the sailing are back from the canoeing at Gudenåen. If the guests are staying overnight, the campsite will offer to keep their luggage in a locked room until the 1st day of sailing is over. At the end of the canoe trip at Gudenåen, the manager will pick up the canoes at the end of the day. The canoe holds up to 3 adults or 2 adults and 2 smaller children in a canoe. Gudenåcamping Brædstrups cooperates with Tørring canoe rental and Silkeborg canoe rental. At Gudenåen between Tørring and Mossø, all sailings must be registered. If you wish to sail on this stretch in your own canoes or kayaks, you must therefore obtain a permit. Overnight guests with private canoes / kayaks may launch the vessels from Gudenåcamping Brædstrup if they have the required permit. Private canoe and kayak sailors, who do not want to stay at Gudenåcamping Brædstrup, please refer to the public places with public access. 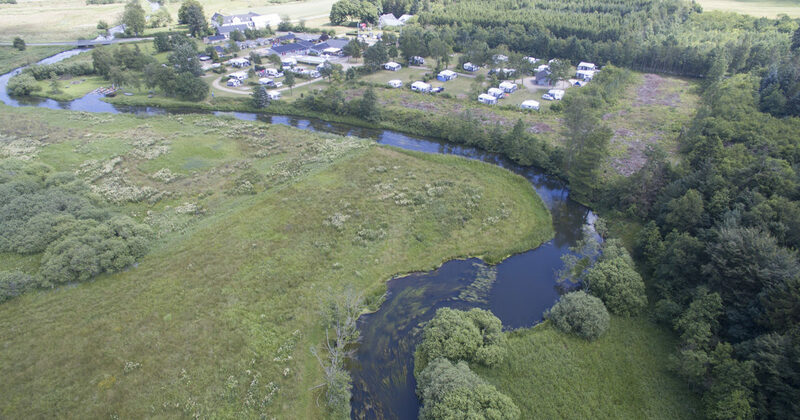 If you wish to pick up a vessel at the campsite without staying overnight, a fee of DKK will be charged. 25, – per canoe / kayak, and guest card for DKK 10, – per person.